This holiday season, Acorn Media is releasing one of their best-selling series in one of their nicest and biggest value-priced sets ever: Agatha Christie’s Poirot: The Early Cases Collection. 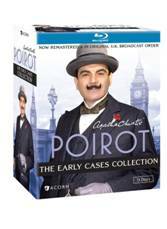 Newly remastered and restored to their original U.K. broadcast order, Agatha Christie’s Poirot: The Early Cases Collection arrives on Blu-ray and DVD from Acorn Media on October 23, 2012, including all 45 mysteries from the first six series of the television phenomenon. David Suchet stars as Agatha Christie’s mustachioed mystery-solver as a “near-perfect Poirot” (USA Today). Brimming with opulent 1930s period details and co-starring Hugh Fraser (Sharpe), Philip Jackson (Little Voice), and Pauline Moran, these lavish adaptations look better than ever. Agatha Christie’s Poirot has aired on ITV1 in the U.K. since 1989 and on PBS and A&E in the U.S. The 13-disc Blu-ray and 18-disc DVD sets include all 45 mysteries from Series 1-6, now with SDH subtitles and collectible foil packaging ($249.99/$199.99, www.AcornOnline.com). Guest stars include: Damian Lewis (Homeland), Christopher Eccleston (Doctor Who), Donald Sumpter (Games of Thrones), Kate Buffery (Wish Me Luck), Anna Chancellor (Four Weddings and a Funeral), Jeremy Northam (The Tudors), and Samantha Bond (Downton Abbey).